Designed for any locations accessed by the general public, including: schools, day care centres, aged care facilities, hotels, shopping centres, hospitals and medical clinics, public and private transport, and building maintenance. Effective on blood, urine, vomit, faeces and any other liquid spill which poses an infectious health risk. There is sufficient absorbent and tools in each kit to contain and control the average stomach volume. Highly effective, readily incinerable and competitively priced. Absorbent sachet also sold separately. For use by any business that has identified risks due to spills involving body fluids (ie: blood, vomit, urine, faeces), tissue samples, spoiled foods, sewage, sullage or other potentially infectious liquids/wastes. Industries include governments, education organisations, child and aged care facilities, public transport, hospitality, commercial/retail operations, service industry, health & medical. Highly absorbent — each kit contains enough sorbent for 500mL of liquid and has been designed to absorb the average liquid stomach volume. 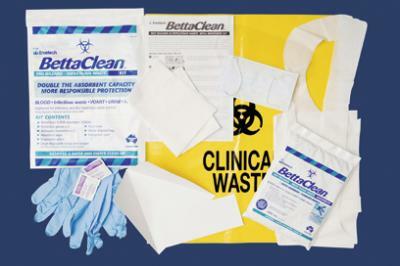 Comprehensive solution — contains high capacity sorbent, PPE and clean-up accessories. Also contains dust-free, disposable Nitrile gloves. No latex. Safe — unique Fibre LockTM Technology locks in wetness and odours. Large disposable clean-up tools minimise the risk of contact with spilt liquid. Easy to use — comes in a compact sealed bag and a detailed instruction card. Eco-friendly — Sorbent is made from organic fibres and is 100% incinerable.